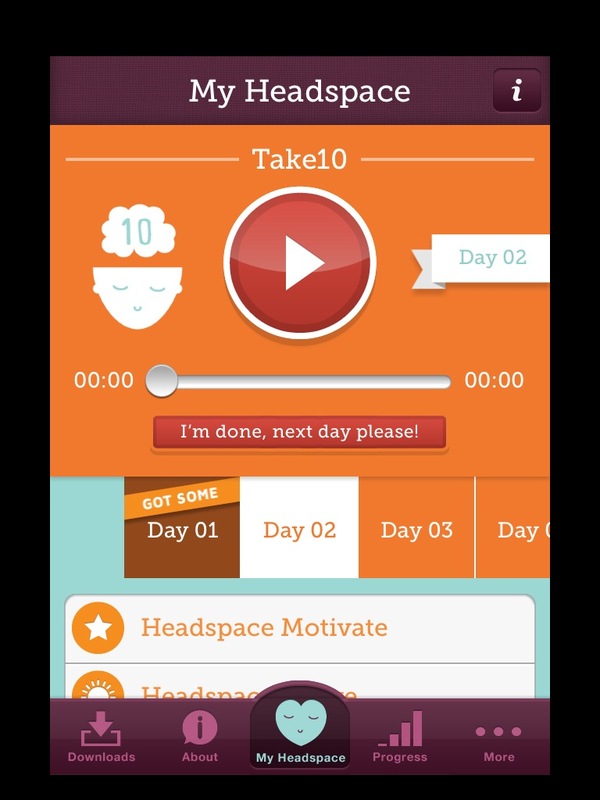 Headspace aims to help users develop a habit of meditating for 10 minutes every day. One of the ways they make it easy is through a free 10-day program app, “Take 10.” I used the app for this review. Take 10 really is easy to use. I loaded it up on my iPad and was good to go. The introduction encourages you to watch four brief videos explaining how to meditate. I’ve done seated meditation off and on for more than a lot of years, but I watched the videos. If you’re new to meditation, they do an excellent job of explaining what to expect. If it’s been a while, the little refreshers are short and not at all preachy. All of the meditations are guided by Andy Puddicombe, an ordained Tibetan Buddhist monk and founder of Headspace. Andy is from the UK, so he’s got that British accent going for him, which I loved. There’s no Buddhist preaching. Don’t get me wrong; I’m a Buddhist. But if you’re not, no worries that Headspace will try to convert you. The meditations worked for me. Following each session, I felt calmer and more centered. The sessions go really quickly. My last session was over before I was ready. You can set reminders so you won’t skip your daily 10. The screen doesn’t rotate. I had to prop the iPad with whatever was handy. I know, first world problem, but it drove me nuts. Continuing with Headspace requires a subscription. The app only covers 10 days, just enough to leave you wanting more, and more will currently cost you as much as $14.95 per month US. That won’t fit into our family budget right now. Of course, you can continue meditating on your own, but I really liked the convenience of having Headspace on my iPad. Every time I touched the Facebook icon, I was reminded that I could spend the next 10 minutes far more productively. Bottom line: Headspace Take 10 is a crazy good app. There are lots of meditation resources on the Internet and bunches that are free. Beliefnet has some very good guided meditations, including some with Thich Nhat Hanh, my personal favorite Zen master. But Headspace makes meditation easier. It’s right there on my iPad and reminds me to use it. If I could afford it, I’d get the subscription today.